Six Maritime believes that providing quality services is priority one. We strive to establish long-lasting business relationships with our clients. We acknowledge that our commercial clients must carry the additional cost burden associated with paying personnel while they are attending our training. For this reason, we make every effort to structure our curriculum into time-sensitive blocks packaged to fit within a standard workweek. Our training program is concise yet thorough and will reinforce the operators’ “security focused” mindset. It is designed to address all fundamental aspects experienced by those placed in maritime security environments. However, nothing can underscore the importance of continued training and experience on the job. This course will provide the tools and basic knowledge to our graduating students enabling them to continue to develop their skills with time on the job by adhering to the lessons they learned during our instruction. 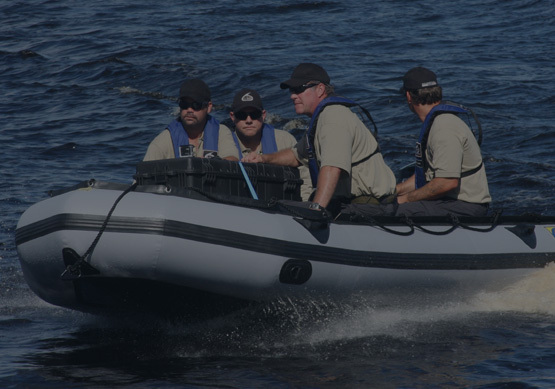 While students will gain an intimate understanding of the types, tactics, techniques and procedures associated with waterborne patrolling activities, this course is not intended to produce expert waterborne patrolpersons within the one week of instruction. To produce competent, tactically proficient patrol boat coxswains who demonstrate the ability to conduct safe and effective around the clock waterborne security operations. This period of instruction will familiarize the student with the general plan of action for the duration of the course. Participants will be given the time to give and receive introductions, which will include relevant background information in order to promote class participation. The time will be used to explain all of the course objectives and the criteria used to satisfy course requirements. Students will become familiar with all of the training materials and references for which they are responsible to know. It will cover general policy like behavior attitude and safety expectations and set the tone for a positive and focused week of instruction. Training will frame in the primary duties and responsibilities of a qualified waterborne patrol coxswain. Subject matter will also review relevant regulatory instructions, which act to outline the scope and relevant importance of the waterborne patrol mission. It will emphasize the serious nature of the position and encourage students to maintain a professional and security focused mindset for the duration of the course. Training will support participants to become knowledgeable on each of the boat’s primary systems; they will be required to demonstrate how to safely operate each functional piece of equipment. Additionally, students will learn all safety features and emergency procedures for each system as applicable. Students will gain a basic understanding of system maintenance as relevant to routine operations. Training during this period of instruction will cover all the critical skills the boat coxswain will need in order to pilot, navigate and maneuver the boat. Participants will learn skills needed to conduct ramp launch and recovery, mooring and pier tie-offs, tight space maneuvering and high speed maneuvering, to name a few. They will learn the basic guidelines for rules of the road for safe waterway navigation. Topics will include international traffic rules and regulations, navigational aids, light markers, controlled area boundary markers and general safety considerations associated with operating a patrol boat in congested port environments. Training covered under this topic will focus on actual tactics, techniques and procedures used to effectively patrol a waterborne secure boundary. Students will learn the difference between proactive and reactive patrolling. Students will gain familiarity with how to quickly identify maritime threats. Additionally, this section will highlight various threat conditions and the applicable techniques associated for each condition. Training will concentrate on how to deal with breaches of security, internal and external emergency response. Participants will learn the appropriate methods to interact with local and regional law enforcement and security forces such as: harbor patrol, coast guard, port authority, etc. Students will gain a general understanding of various organizations’ areas of responsibility appropriate to the situation and the best means to communicate with these authorities. This section will highlight all of the primary learning objectives and their associated enabling objectives identified as critical skill or core knowledge. It will act to reinforce these critical objectives and give the students the opportunity to refresh memory for topics covered earlier in the training prior to taking the written exam.